Slicer Knives for Restaurants and restaurant kitchens come in durable stainless steel and are great for slicing turkeys and roasts. These restaurant utility Slicer Knives are strong and durable for busy commercial kitchens. Buy your wholesale Slicer Knives here at the restaurant supply superstore. We stock roast slicing Knives from top manufacturers like RH Forschner, Vollrath, Mundial and Russell Harrington. 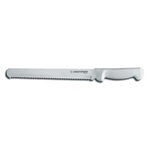 Forschner Granton Slicer Knife - 14 in. Forschner Granton Edge Blade Slicer - 12 in. Mundial Slicer With Wavy Edge Knife White Handle - 10 in. Mundial Slicer With Wavy edge Knife White Handle - 12 in. Mundial Slicer With Granton Edge Knife White Handle - 12 in. Russell Scalloped Roast Slicer Knife - 12 in. Russell Duo Edge Roast Slicer - 12 in. Russell Sani Safe Roast Slicer - 12 in. Russell Scalloped Utility Knife Slicer - 10 in. Russell Scalloped Utility Knife Slicer - 12 in. Russell Scalloped Roast Slicer - 12 in. Russell Scalloped Utility Slicer - 6 in. Russell Scalloped Utility Slicer - 8 in. Russell Scalloped Utility Slicer - 9 in. Sofgrip Roast Slicer with White Comfort Grip Handle - 12 in. Buy your restaurant kitchen Slicer Knives from the leader in restaurant supply smallwares for cutting bread or meats with.